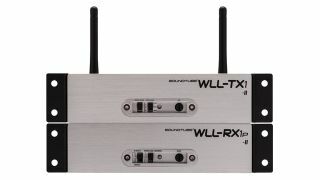 The What: SoundTube Entertainment is now shipping its updated WLL Series wireless transmitter/receiver system. Designed to wirelessly deliver audio while supplying 50 watts per channel to speakers, the new WLL-TR1P-II system uses three frequency bands to minimize interference from nearby wireless systems. The What Else: A user-selectable switch allows the selection of 2.4 GHz, 5.2 GHz, or 5.8 GHz as the operating band. Within those bands, the system frequency-hops through three RF channels to find the clearest path between the transmitter and receiver(s). Up to 10 WLL receivers may be used with a single transmitter. The SoundTube WLL system uses uncompressed audio for maximum audio quality; the transmitter may be connected to a variety of line-level audio sources such as a mixer, computer USB output, balanced preamp outputs, and more. In addition to the dual 50W outputs for speakers, the WLL receiver offers direct connection to devices such as assistive listening systems and also allows direct connection of a line-level signal. The user only needs a power source at the speakers, enabling the placement of speakers in existing installations without the need to run new wiring. The Bottom Line: With a choice of three frequency bands, the WLL system gives users flexibility for deployment in a wide variety of new and retrofit installations, including temporary audio setups (indoors or out), gas stations, houses of worship, and classrooms.